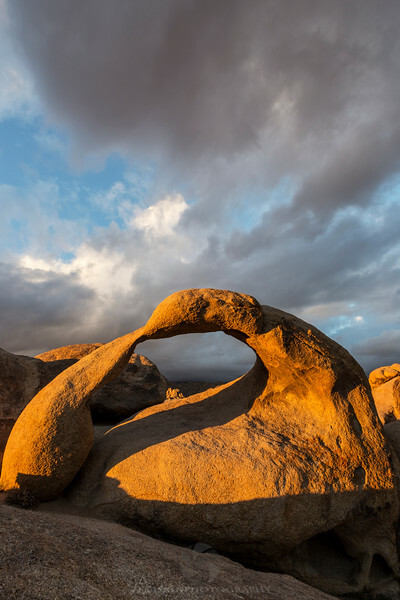 This is the view through the famous Mobius Arch in Alabam Hills. 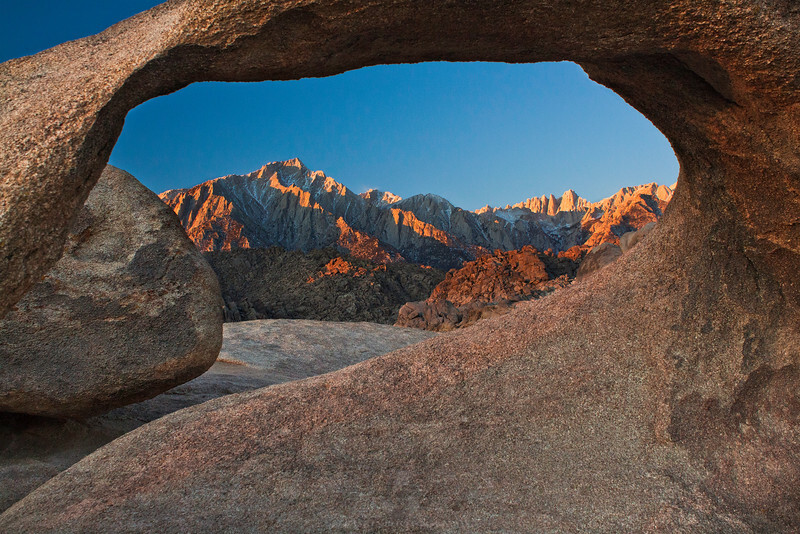 Every morning the Sierras that are framed by the arch get washed by the sunrise's bright glowing light. 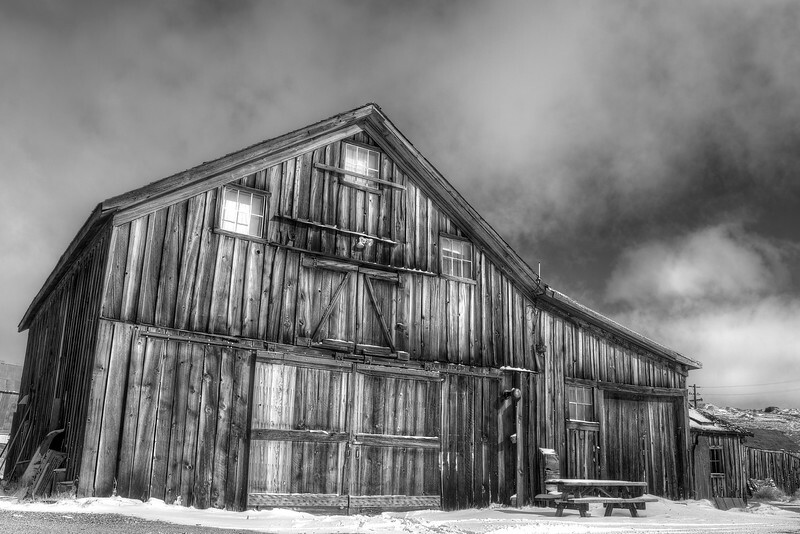 This old barn is more than a hundred years old and sits in the middle of the once thriving gold mining town called Bodie. Bodie is known as the best preserved ghost town in California. And while it's thousands of residents have since vanished, it's richness and beauty are more alive than ever. 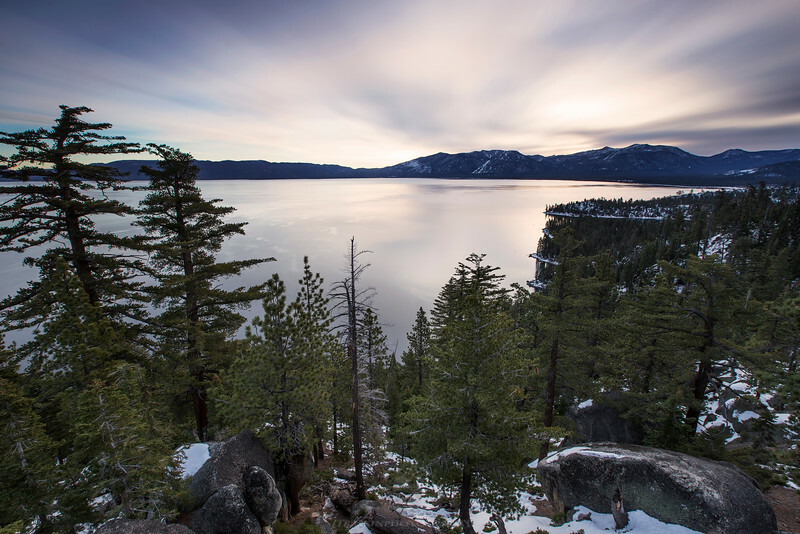 Having skied in Tahoe many times but never really taken any photos there and with almost no snow anyhow, I was more than satisfied to spend this winter trip shooting photos. While we did hit the slopes once or twice I was sure to explore the lake throughly. I made this my first stop on New Years day as it is easily shot from near the road and the night before's celebration was "on my mind." With almost no rainfall in California through New Year's, Most of the lakes in the valley and the Sierras were scary low. 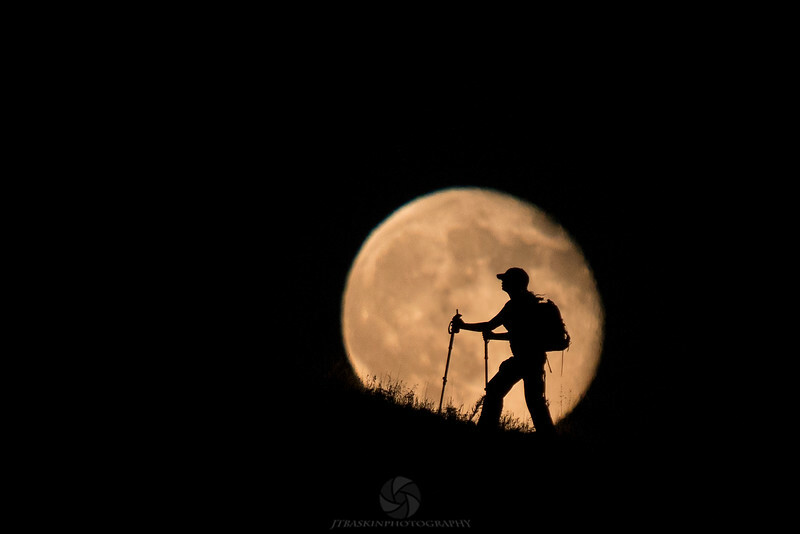 While the drought is very bad for our farms and economy and I was really bummed with the ski conditions, the introduction of extreme conditions always makes for new and sometimes unique compositions, as is the case with this shot. These withered stumps will surely be submerged again before long. 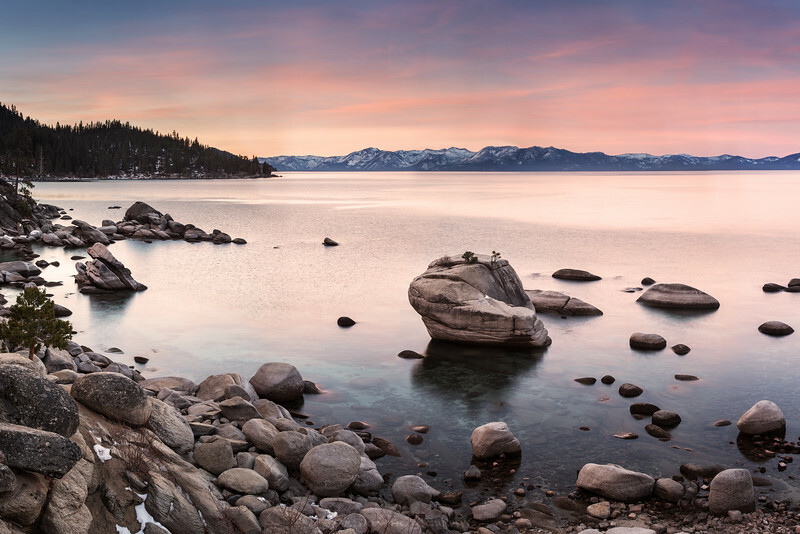 Another one from our trip to Tahoe last week... this shot was taken from the western shore of the lake at a popular "bouldering" spot just before sunrise. I took this shot perched on a small flat atop of a 20 foot high boulder. I was rather fortunate to get into this spot, as a fairly small limb had fallen at just the right angle and spot to allow me to shimmy up it and on the boulder. 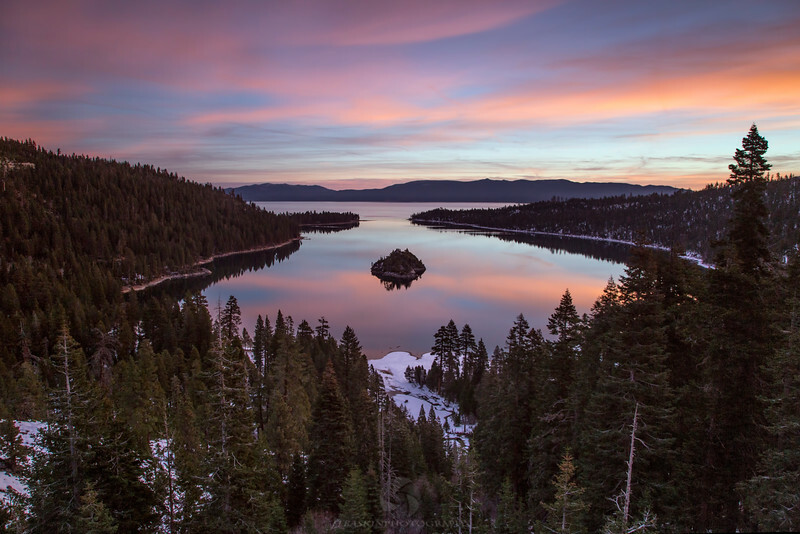 And due to the cracking I heard coming down, I doubt very much that it will be there next time I visit Tahoe. Here you see the well known "Bonsai Rock" framed in it's cove and some nice soft colors in the sky. Although not the "explosive" sunrise I tend to prefer, I really like the pastel palette in this shot! This waterfall near Devil's Postpile is well known for the beautiful rainbows it produces in the the summer months. Unfortunately the cloud cover and trajectory of the sun meant no such rainbows for me. 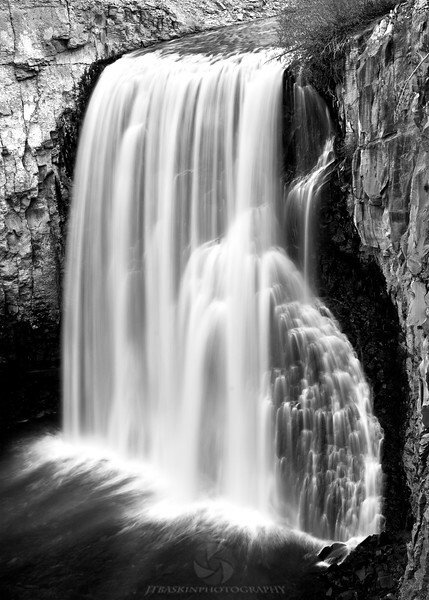 I opted to show only the waterfall and convert to monochrome for the effect I was looking for. 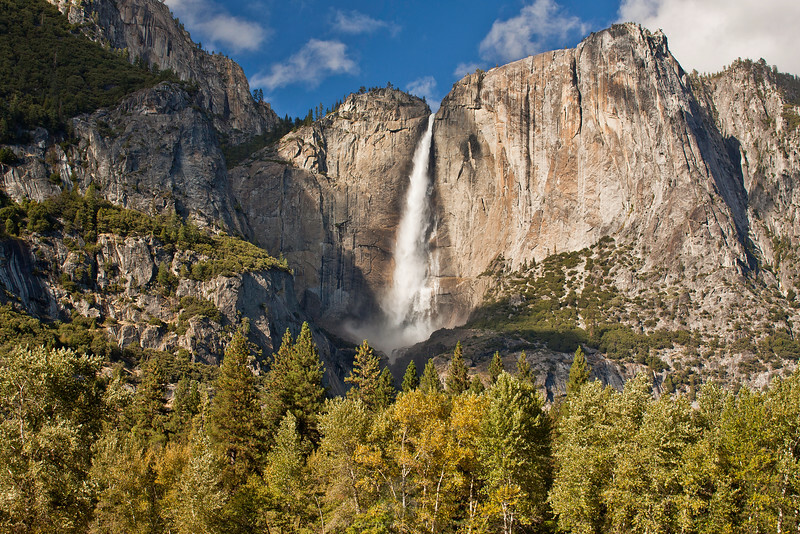 Yosemite Valley is famous for dramatic storms, dramatic mountains, and dramatic light which is perfect for dramatic photos. 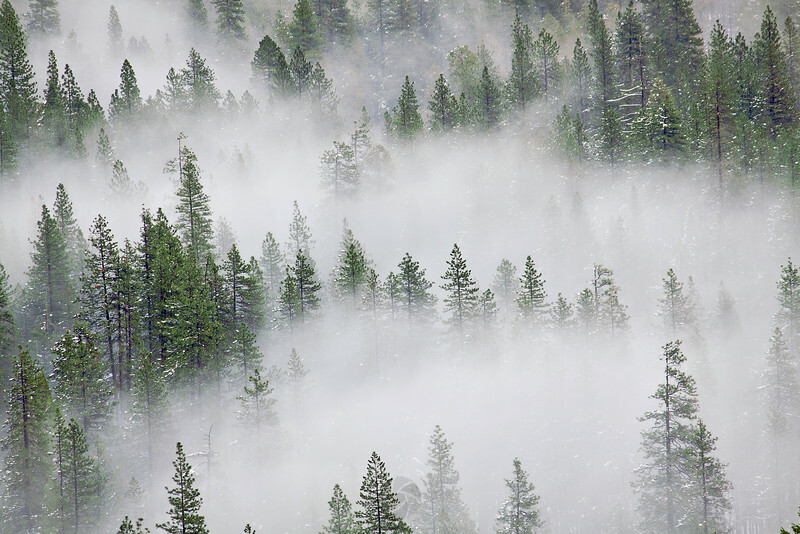 As is the case with this detail of the evergreen forest found all over the Sierras. I just love the mood, patterns, and composition created by this settling patch of fog in the valley. This very popular spot in Yosemite Valley often referred to as "Valley View" or "Gates of Yosemite" is best shot in a late afternoon light . 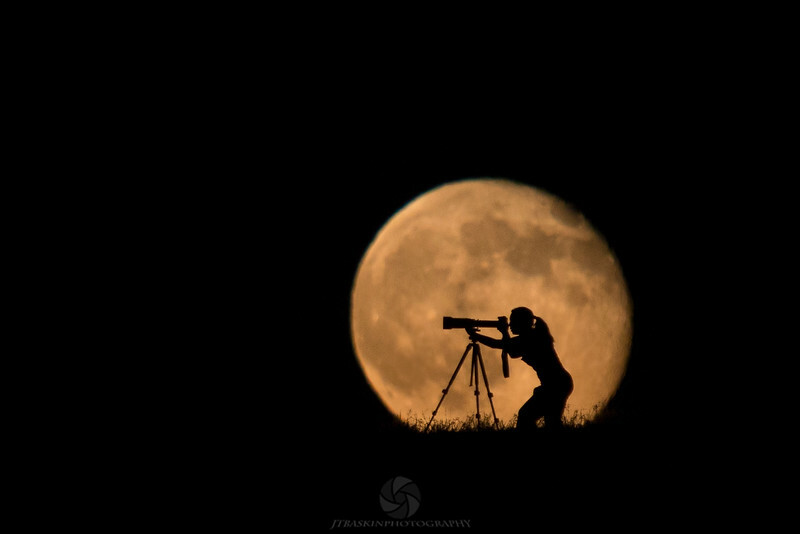 But get there early because you will normally find at least a few other photographers already set up. Bridaveil Fall is the waterfall seen on the right side of the valley from Tunnel View. And can dry up to just a trickle during the winter months. 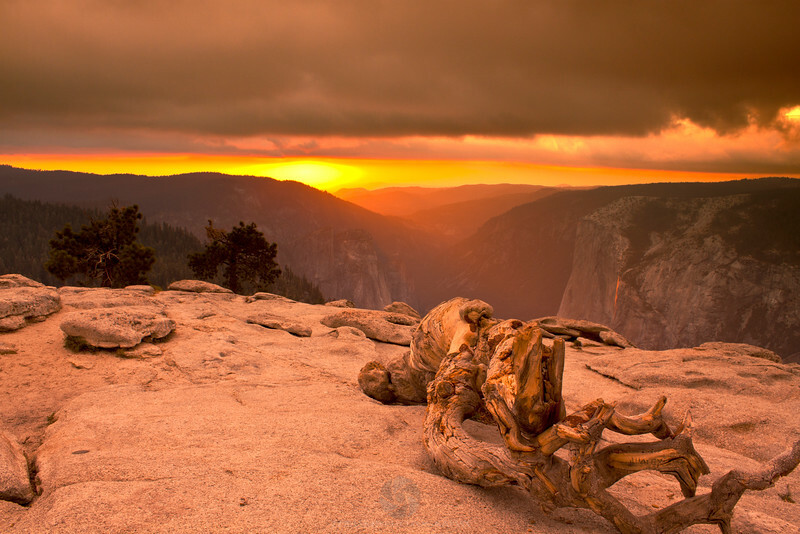 Yosemite Valley at Sunset looking West from the top of Sentinel Dome. 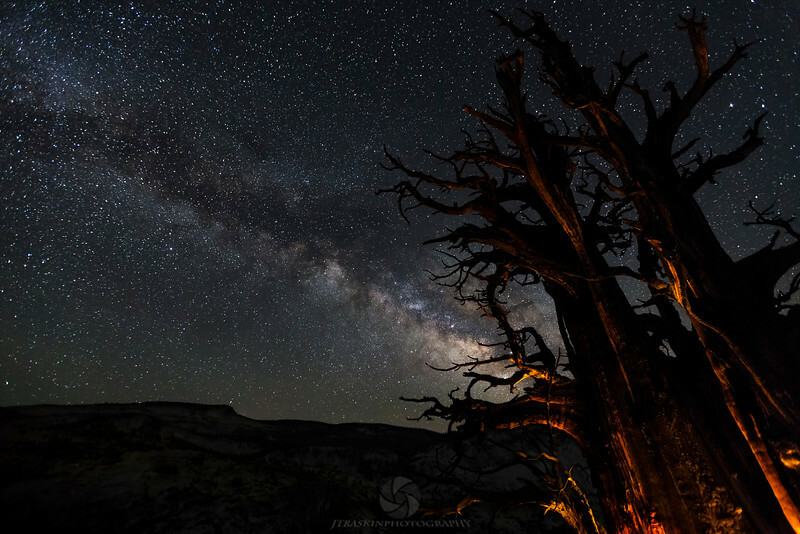 This is the famous Jeffrey Pine at the top of sentinel dome, although no longer standing, it was once considered the world's most photographed tree. 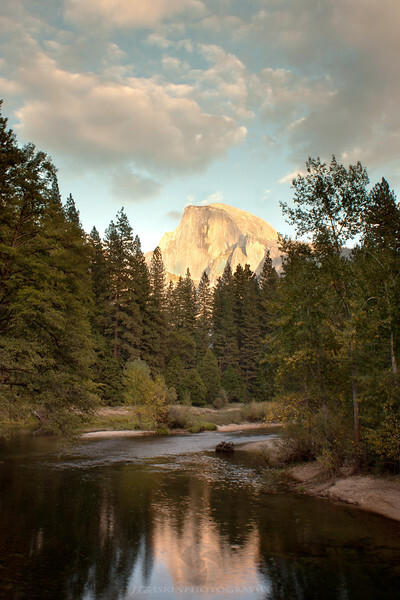 This famous view of Hlaf Dome was captured from Sentinel Bridge in Yosemite Valley. The cloud cover and afternoon light make this shot work. 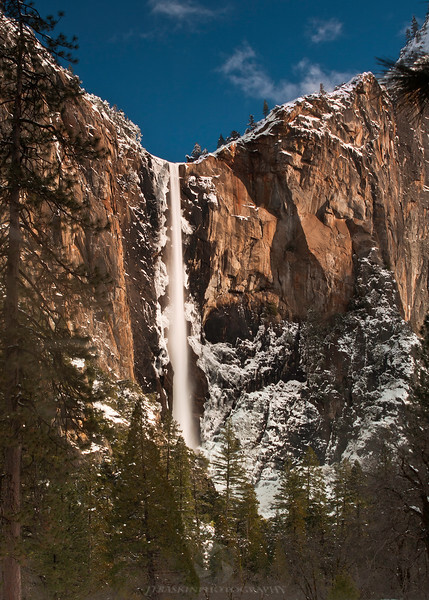 Upper Yosemite Fall and Lower Yosemite Fall combine to make the tallest waterfall in America. I love the brilliant fall foliage and warm morning light. I captured the fading light upon Mt. 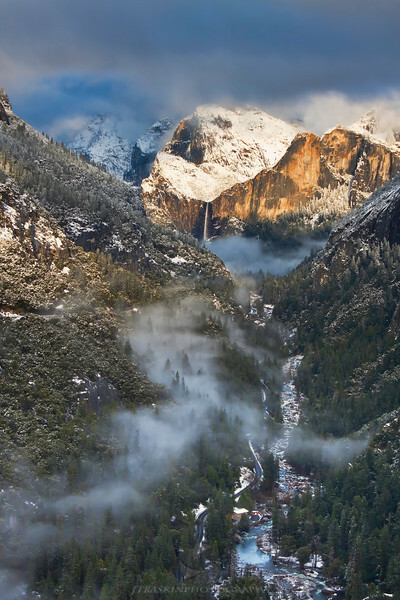 Dana from Tioga Road in Yosemite National Park late one fall afternoon. 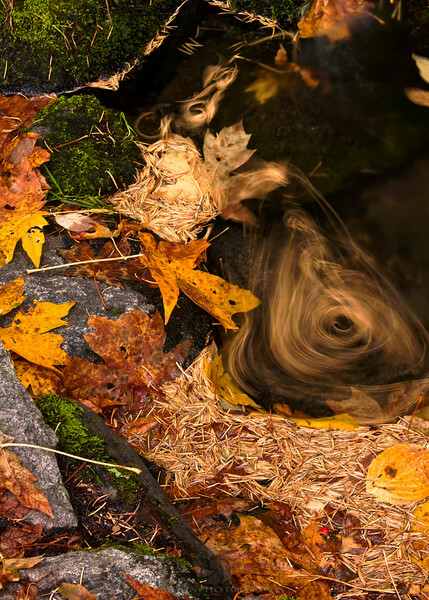 The fallen foliage swirling around in Fern Spring made in really cool effect in this abstract image taken in Yosemite National Park. Tioga Pass, in Yosemite, was open extremely so I took the opportunity to access the high country and the eastern side of the Sierras as much as possible. 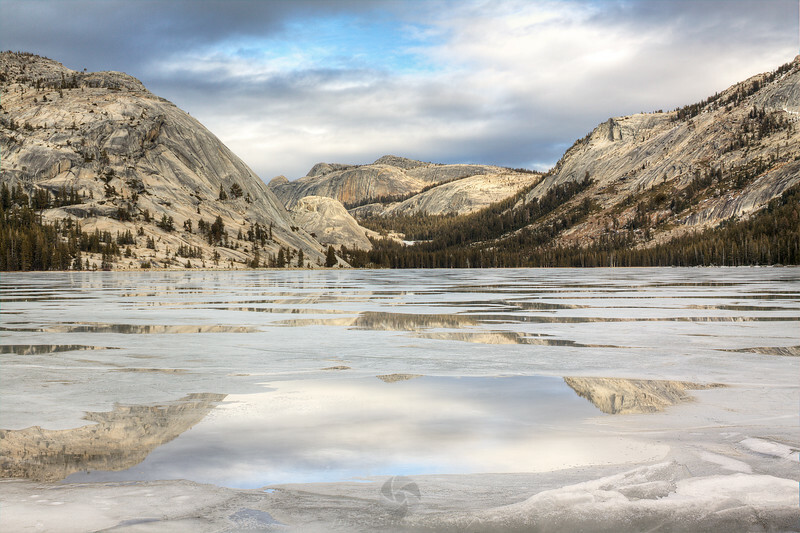 On this trip I spent the afternoon shooting a frozen Tenaya Lake. Temperatures had been just warm enough to create these awesome reflecting pools but still cold enough to allow me to walk out onto the ice. It took me a while to find a group of pools that reflected the scene ahead to my liking. However I eventually found this spot, pretty much right in the middle of the lake, and I am pretty pleased with the result. This less popular view of Bridalveil can be found along the Big Oak Flat Rd. coming into Yosemite National Park from the North. This was taken after a significant spring snowstorm. I was trying to get to Tunnel or Valley View for the best light of the day but decided that I wouldn't make it and opted to set up here instead. Glad I did because the warm late afternoon glow on the cliffs and the low hanging clouds in the valley below gave this scene added interest. And, in the end, I got a more "original" shot. 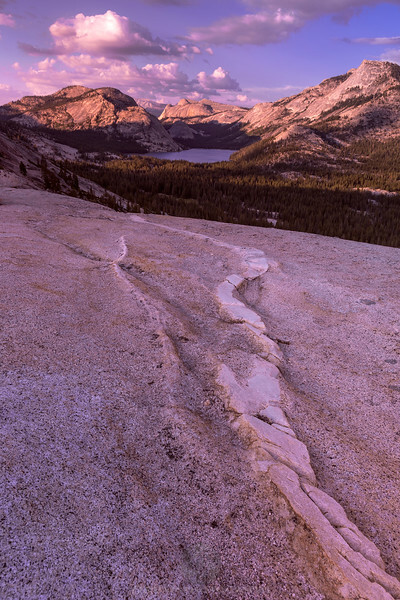 This scene was captured atop of "pothole dome" in Tuolomne Meadows in the high country of Yosemite. The boulders here, known as glacier erratics, made for nice foreground elements. 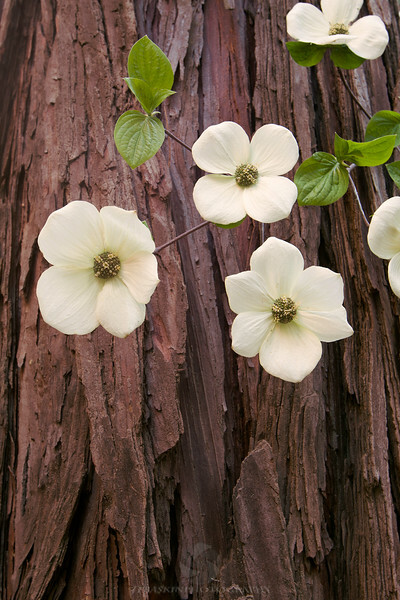 Yosemite National Park is not famous for it's wildflower displays but every May - June Yosemite's Valley's dogwoods bloom theses beautiful white blooms. Here I was lucky enough to find a nice composition of blooms set in front of the Sierra's famous redwood. 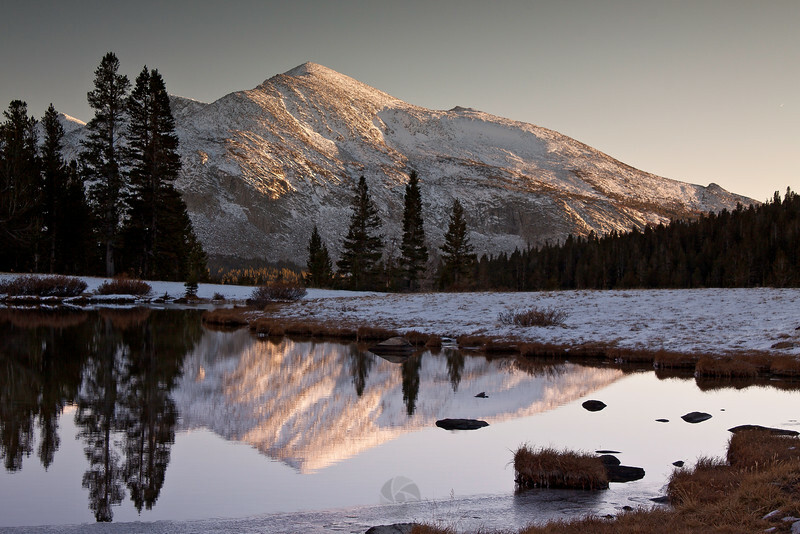 This is a picture of light reflected off the top of the Tuolomne River in Tuolomne Meadows. 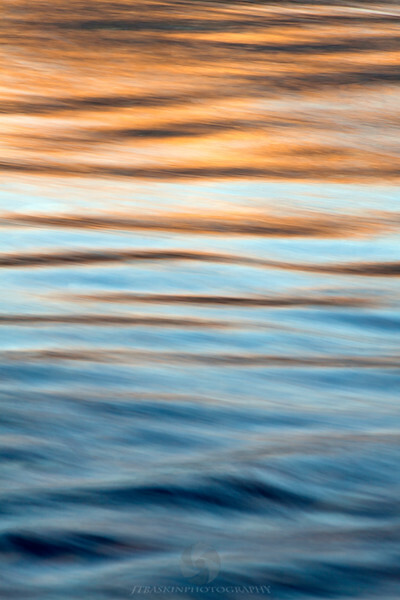 The key to capturing this scene was to slow my shutter speed down enough to get some motion blur while keeping it fast enough to keep the ripples from all blurring together. 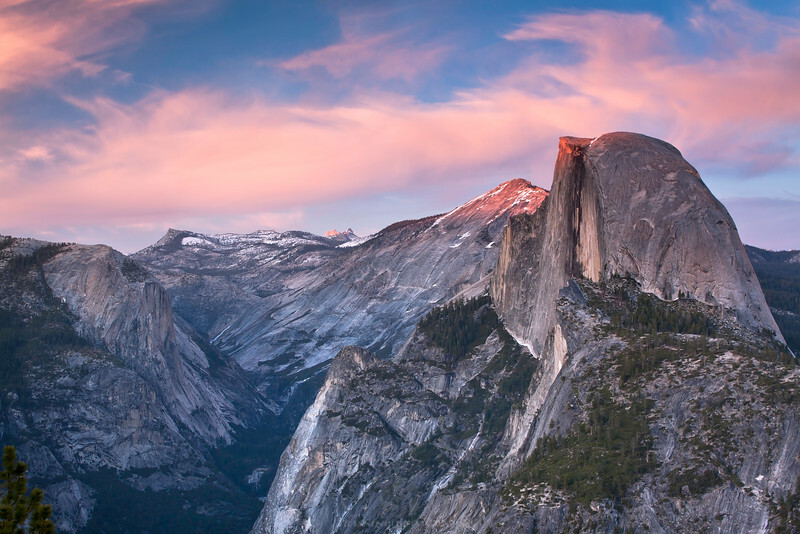 While there are many grand views of Half Dome found through out Yosemite, for me this one, from Glacier Point, is the most stunning. 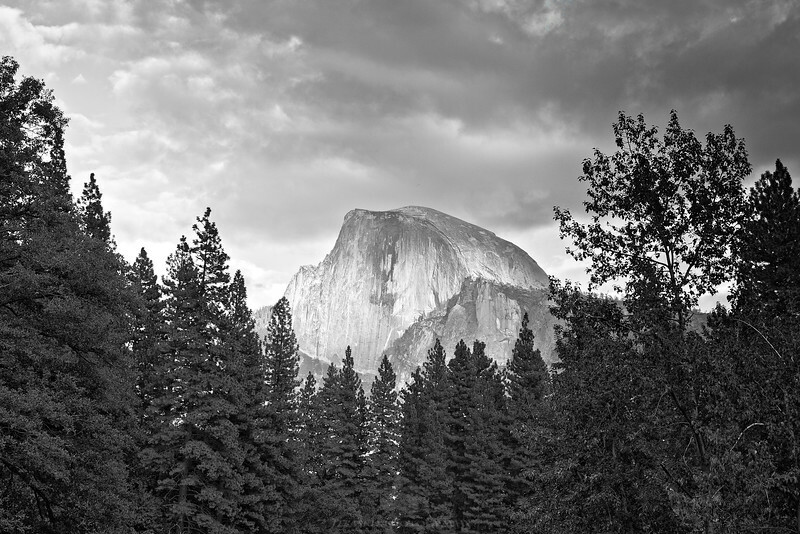 Half Dome appears so "in your face" from this vantage point. 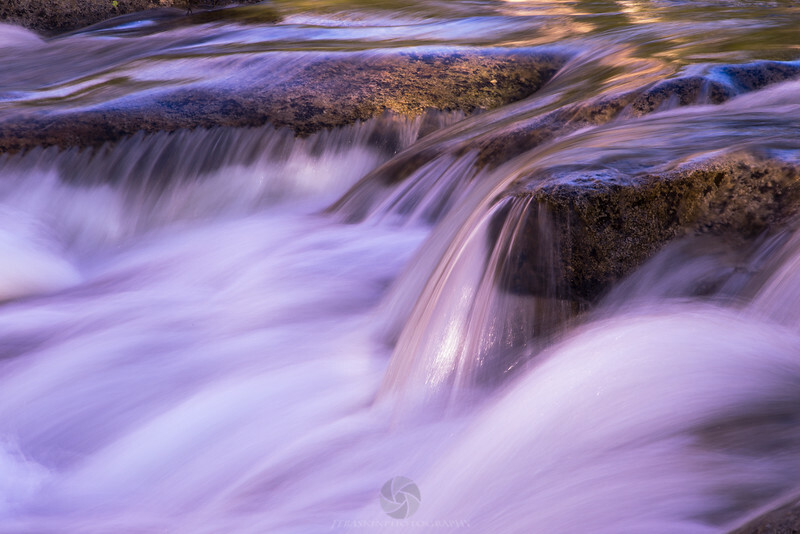 A detail of the soft rapids found along the Glen Aulin Trail in Tuolomne Meadows during the spring melt. 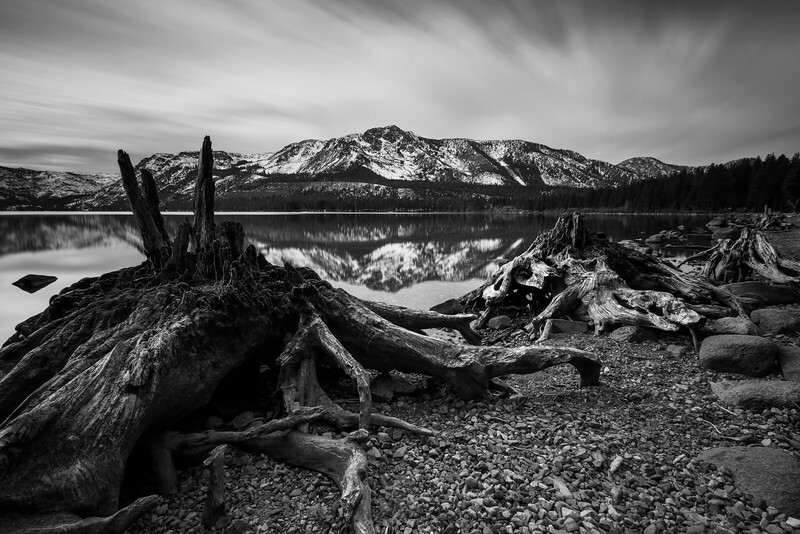 A slower shutter speed, polarizing filter, and the soft afternoon light allowed to make this composition. 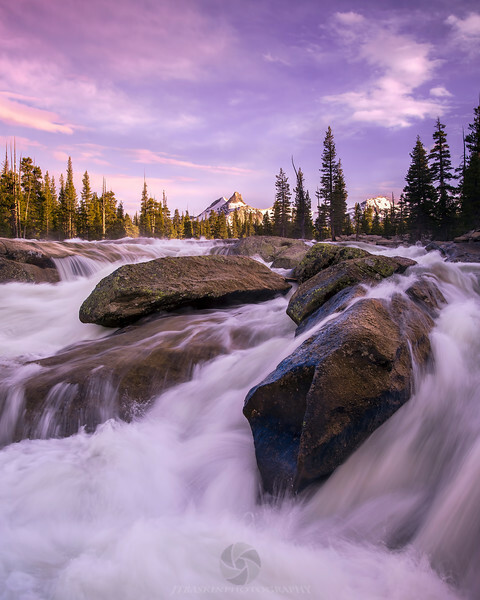 One can found endless photographic possibilities around Tuolomne and Yosemite's high country, especially in the spring when rivers are high and pools of snow melt collect throughout the meadow. 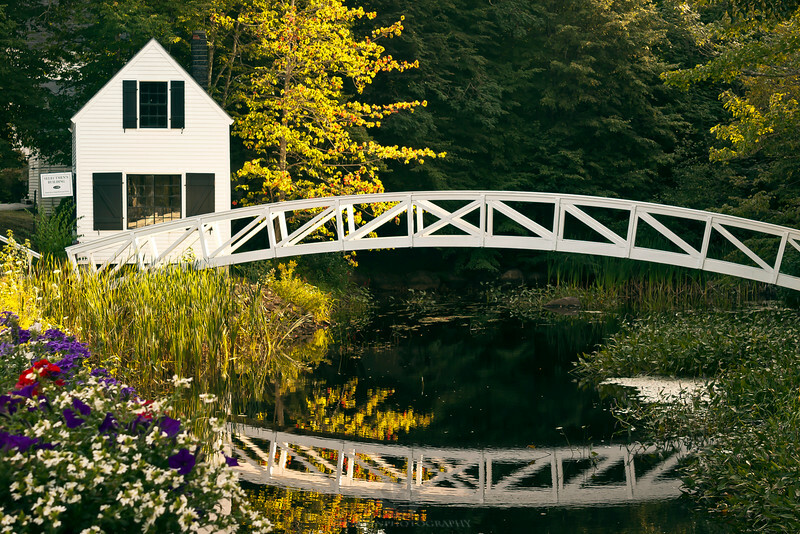 I captured this scene on a spring afternoon while out shooting with a fellow photographer. I had shot here before but with the water slowed to almost a trickle this scene changes dramatically and the spring sun was drenching Cathedral with that nice golden afternoon light. 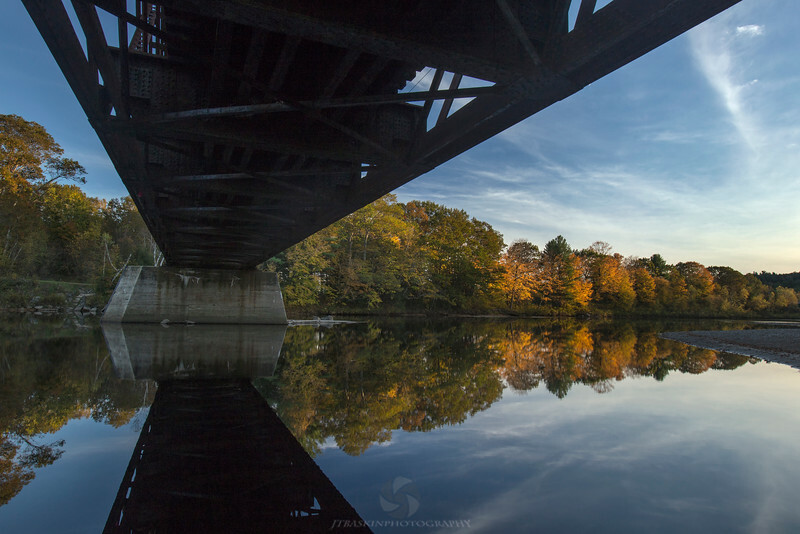 I used a Singh Ray "Blue n Gold" polarizer and a 2-stop soft grad to help even out the exposure. 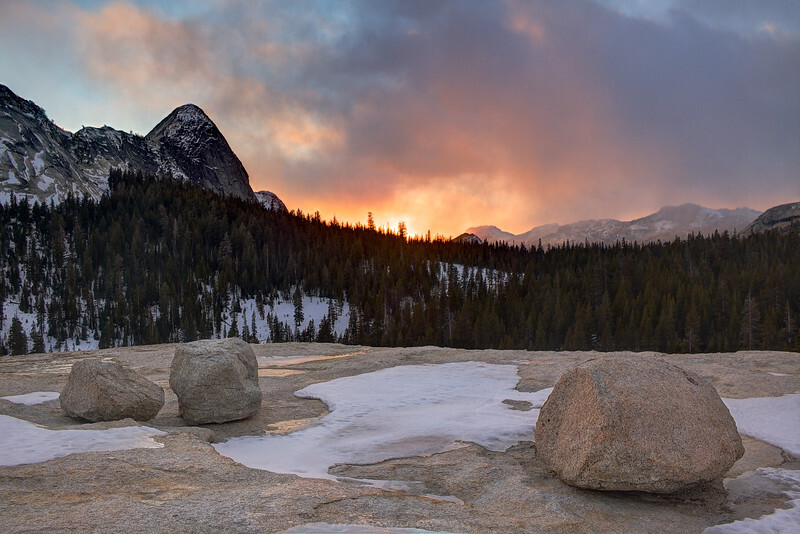 I stumbled onto this scene while doing some scouting in Yosemite during my last visit. 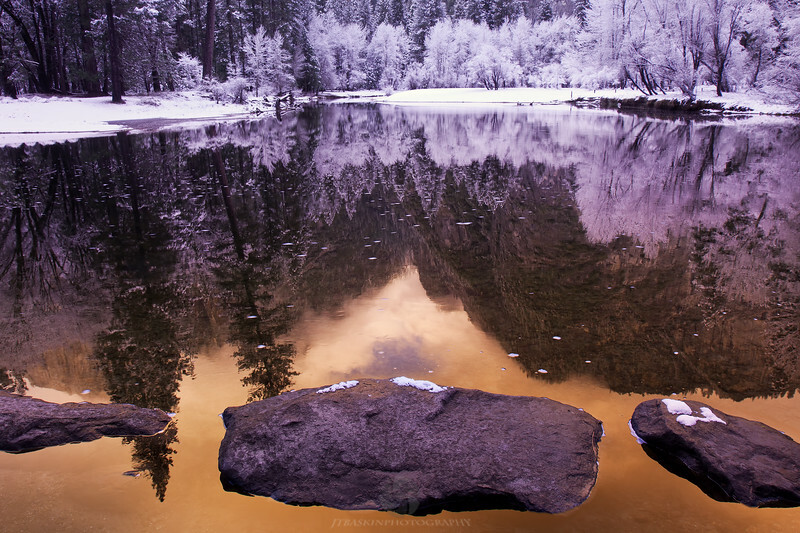 I was first drawn to the scene by the crisp reflections of the snow covered trees in the distance. But as I shot shot close ups of the banks, I noticed the clouds above starting to turn orange in the late afternoon light. 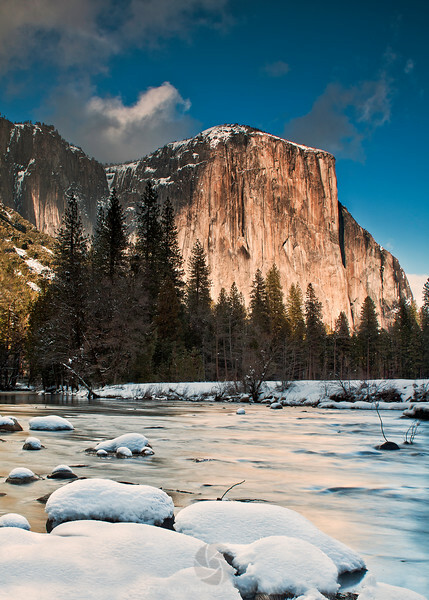 I threw on my blue-n-gold to help really bring out those warm tones and took this wide angle view of the Mereced River and Yosemite's valley walls. I only wish I could have fit all of the three rocks into my composition. 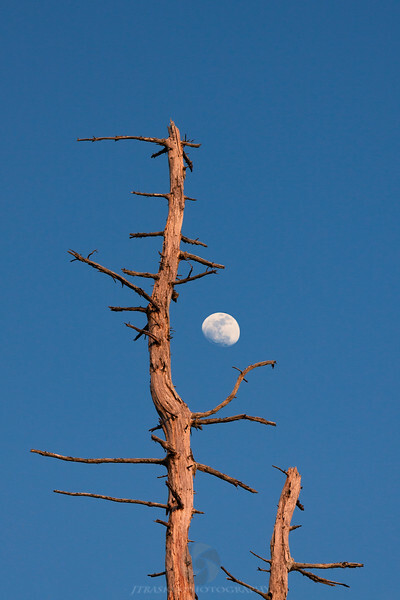 Photographed in Yosemite's Tenaya Canyon, I shot this scene using my smart phone to trigger the shutter release remotely. This enabled to crouch down really low beside the tree and light paint from beneath it rather than head on. 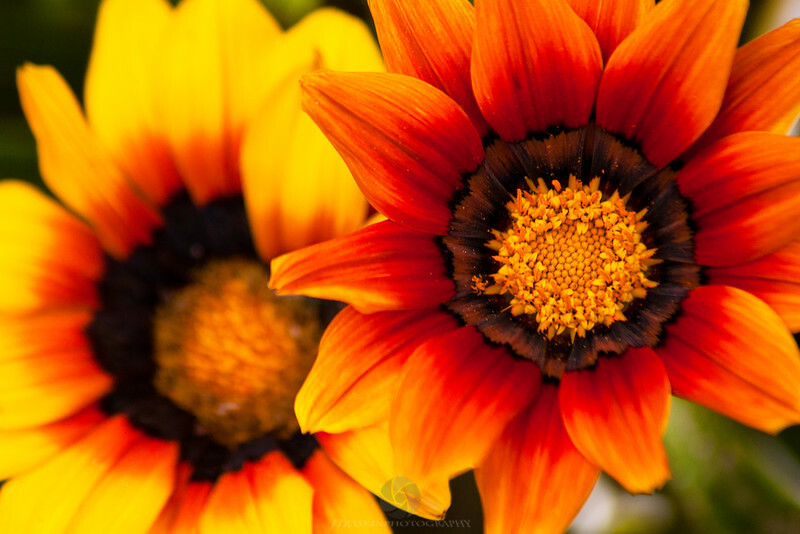 As I was driving from New Jersey to Colorado in the wee hours of the morning I noticed the most spectacular sunrise I have ever seen unfolding in my rearview mirror. I pulled off at the next exit, set up my tripod and managed to snap off a few shots before the color faded. I have no idea where I was... somewhere on I-80. The light was way to harsh to record the awesome color of water at Hanging Lake State Park, CO when I was there. But I did however manage to capture some of that color in these small falls below the lake. 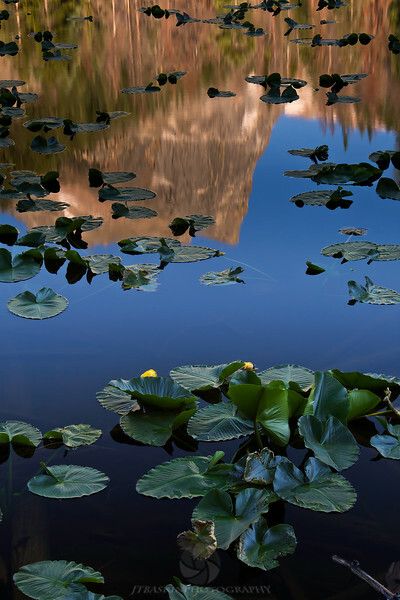 The lilly pads at Nymph Lake in Rocky Mountain National Park can make very interesting foreground subjects and under the right conditions they give off some really neat reflections. While there wasn't much color in the sky, I did manage to capture a nice reflection of Hallett Peak amongst the sea of lilly pads. I decided to shoot waterfalls on this dreary rainy day since the lack of light would make long exposures easier. 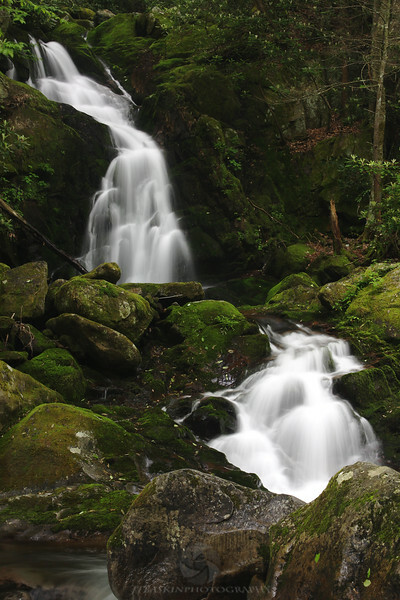 Mouse Creek Falls is probably my favorite waterfall in Great Smoky Mountain National Park. 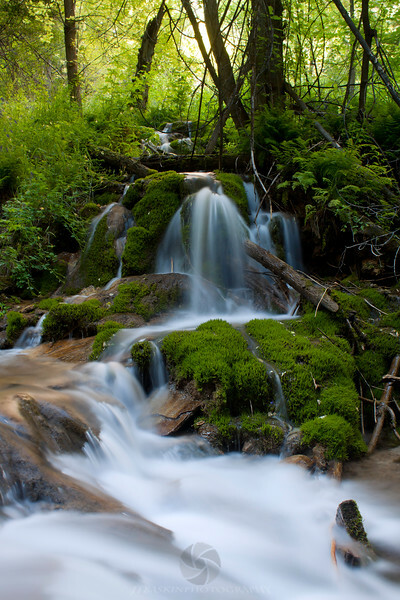 It has a beautiful natural composition and plenty of that great green moss to provide an interesting scene. 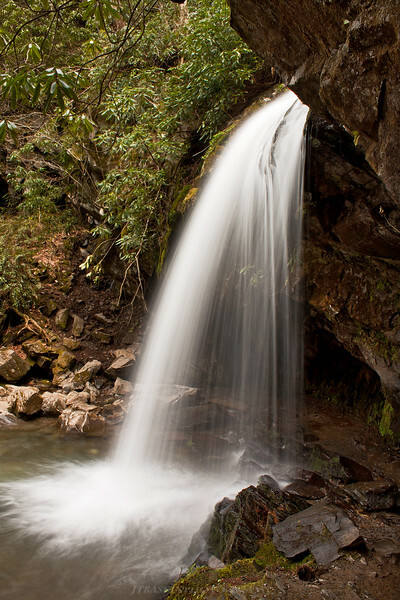 The cave behind Grotto Falls in Great Smoky Mountain national Park make this a favorite place for tourist and locals to play, picnic, and enjoy mother nature. 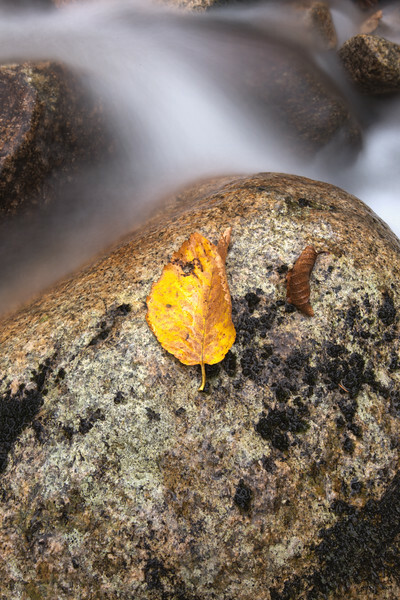 In this image I set up to the side in order to showcase that empty space behind the fall. My wife and I made it out to Lake Tahoe to witness the recent total eclipse of the sun. 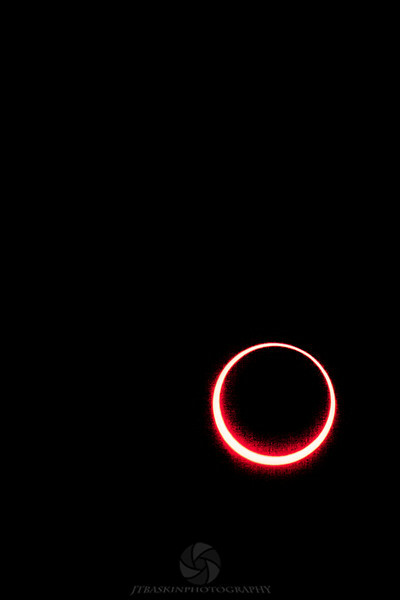 With this shot, I again used my sheet of mylar to get a well defined outline of the total eclipse. But I wanted to give the scene a sense of surrealism and add a little of my own artistic interpretation. Since my mylar prevented me from capturing any real color, I boosted my exposure almost all the way up in post processing. Hence, what you are seeing as a red flare of the sun is actually noise. 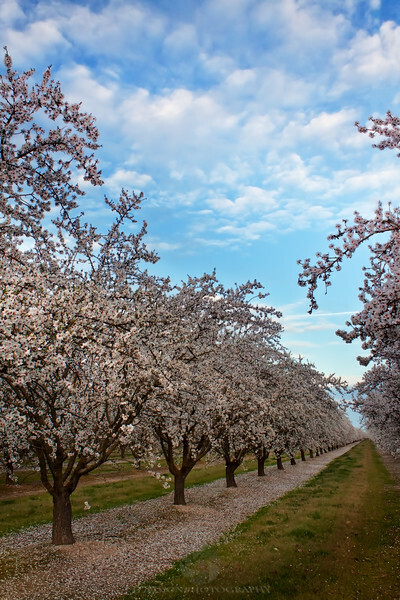 It is widely know around the San Joaquin Valley that the first sign of spring are the almonds. 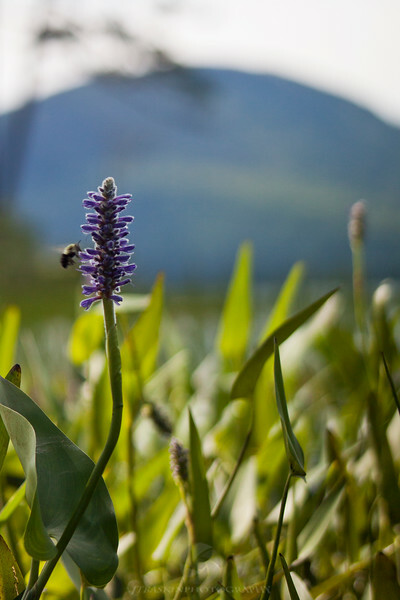 Late in the winter the orchards of almond trees turn into beautiful white blooming fields of flowers. 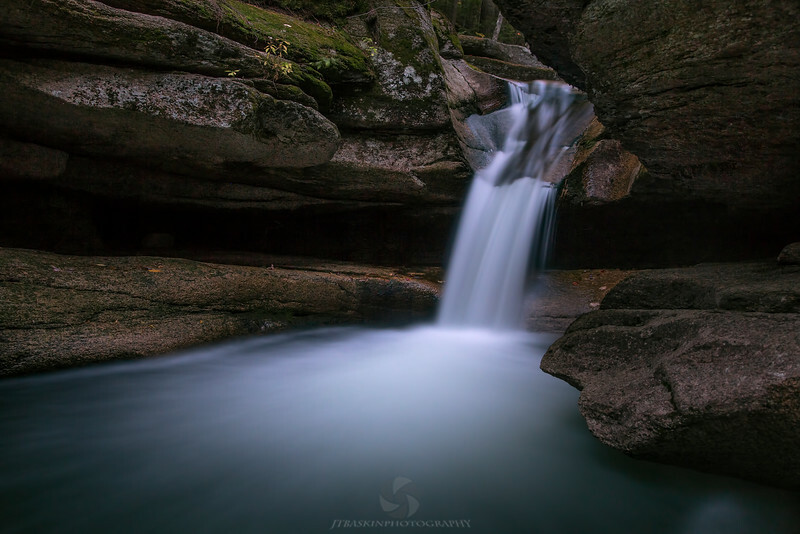 This little known spot called "midnight hole" is located along the trail to Mouse Creek Falls in Great Smoky Mountain National Park. 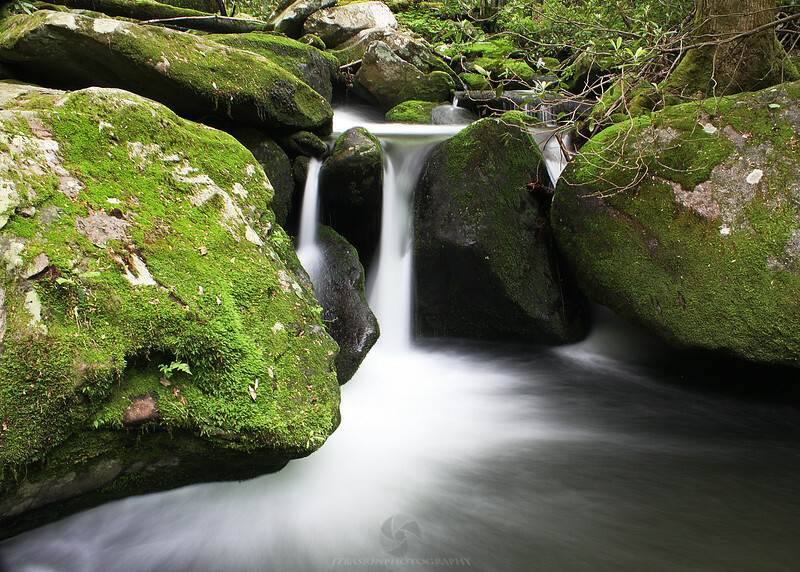 The brilliantly green moss coating the boulders that fill this small stream make this image really pop. I captured this scene on my first vista to Maine in 2010. I love the simplicity and depth that this shot portrays. 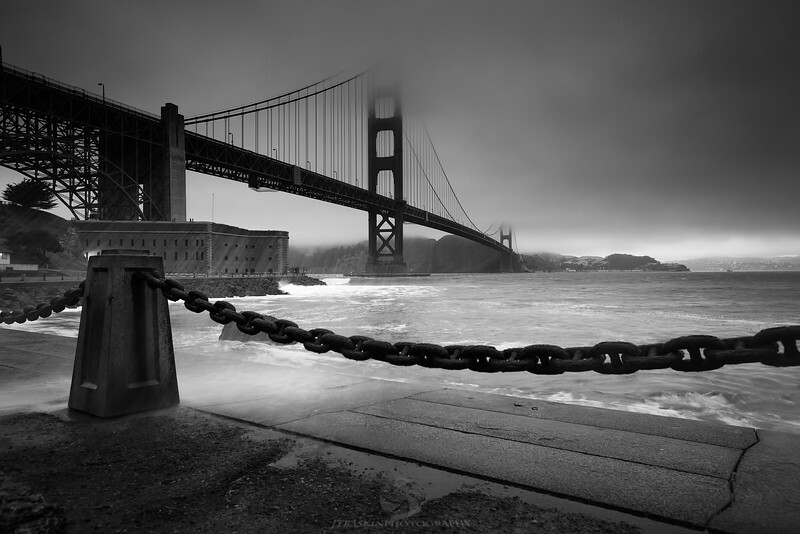 An image of the Golden Gate shrouded in fog taken from Fort Point in San Francisco's Presidio. 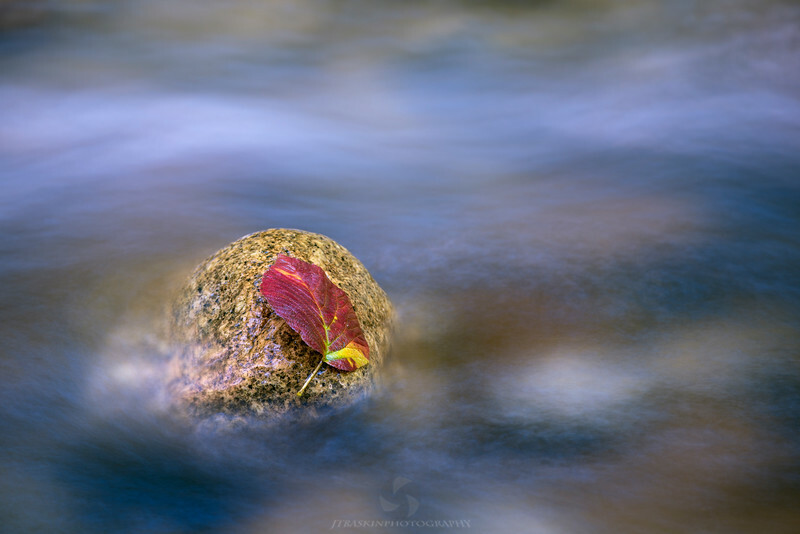 A lone Autumn leaf rest precariously on a small stone in the middle of a New England stream. 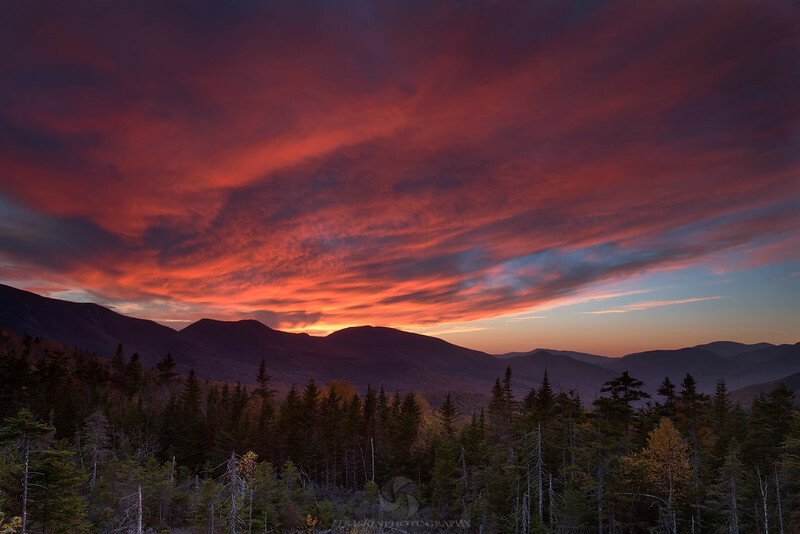 This popular scenic drive through New Hampshire's White Mountains offers many scenic vistas and beautiful hiking trails. One can find this view at the crest of the pass.